When the ocean currents are swift, the fish go low. That was the scientific conclusion of Aaron Cadotte ’18, who traveled to Panama to study marine ecology, specifically, how fish adapt to water flows of different strengths. Cadotte, a physics and math major from Wheaton, Illinois, won a U.S. State Department-sponsored Gilman International Scholarship to study abroad. 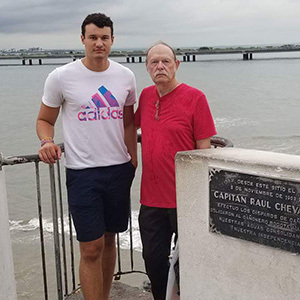 He enrolled in a six-week program, “Panama: Comparative Marine Ecology and Blue Carbon Conversation,” through the School for International Training that involved coursework, independent research, writing a paper and presenting the research results.